We are glad to announce that Dialogue Café Association and Garion Consulting Group signed yesterday, 7 June 2018, in Lisbon (Portugal), a cooperation agreement aimed at establishing a network of Dialogue Cafés in countries of East and Southeast Asia, such as South-Korea, Cambodia, China, Myanmar and Vietnam. In this framework a pilot programme of several sessions focused on the Sustainable Development Goals will be organised before 2019. 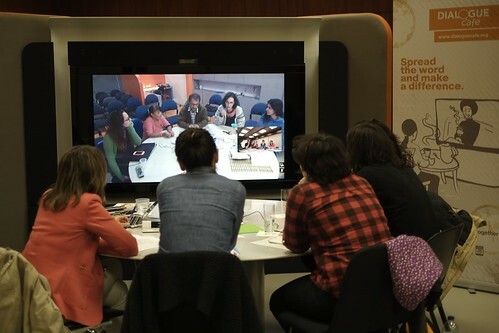 Garion Consulting Group has a large experience on implementing education programmes through CISCO Telepresence system in cooperation with national authorities and international organisations such as UNDP. Through this partnership both we, both parties, aim at promoting intercultural dialogue at the global level. We both believe these kinds of conversations can empower individuals and communities, break down prejudice and misconceptions and promote greater understanding and co-operation across cultures. Keep posted for further information! According to the UNHCR, the number of forcibly displaced people worldwide reached 59.5 million at the end of 2014, the highest level since World War II with a 40% increase taking place since 2011. More than a million forcibly displaced people, migrants and refugees, crossed into Europe in 2015, sparking a crisis as countries struggled to cope with the influx, and creating division in the EU over how best to deal with resettling people. Ensuring their integration and full participation in the economic, social, and political life of the society in which they live is a right that needs to be ensured if we wish to guarantee their social inclusion and the observance of their human rights. In several contexts, arts and culture, more specifically traditional artisanship have been used as vehicle for displaced people social inclusion as making things by hand using centuries-old techniques and traditional knowhow might firstly, promote their empowerment and integration through employment opportunities and self-confidence increase; secondly, contribute to the preservation of intangible cultural heritage in need of safeguarding because of forced migrations and conflicts. In the framework of the Global Exchange of Crafts Makers, Dialogue Café Association is organising this session with the aim of sharing knowledge and promoting mutual learning on how artisanship can be used to promote displaced people social inclusion and the preservation of intangible cultural heritage. With this purpose concrete initiatives being implemented will share their experiences and serve as inspiration for other organisations working in those fields. The main goal of the cycle Global Exchange of Crafts Makers is to promote exchanges and dialogue between different crafts makers around the world with the aim, in one hand, of identifying the challenges and opportunities of this promising creative sector in future economies, in the other hand, promoting a dialogue and transmission of know-how between traditional and innovative artisans, between senior and young generations. The session will take place next 25 May from 15h to 17h London time. Artisanship as vector for refugees’ social inclusion. Sharing European experiences. For further information contact us! Temos o prazer de o/a convidar a participar na Sessão de Abertura Oficial do Diálogo Café Cidade de Praia. Este evento é organizado pela Associação Dialogue Café e pelo Instituto Pedro Pires para a Liderança. Durante a sessão proceder-se-à um intercâmbio de ideias sobre o papel do diálogo na construção da paz e no desenvolvimento da cooperação. Oradores especiais vão juntar-se a nós: em Lisboa (Fundação Calouste Gulbenkian), Dr. Jorge Sampaio, Presidente de Portugal (1996-2006), Presidente do Dialogue Café; na Cidade de Praia (Instituto Pedro Pires para a Liderança), S. Exª Dr. Pedro Pires, Presidente de Cabo Verde (2001 – 2011), Presidente do Instituto Pedro Pires para a Liderança. Participantes baseados em Évora e Rio de Janeiro participarão também nesta sessão especial de inauguração do Dialogue Café Cidade de Praia. Consulte e descarregue o programa. Junte-se a esta conversa global! Enriqueça com sua própria experiência e opiniões! Para mais informações ou inscrições contacte-nos por correio eletrónico. In the framework of a cooperation agreement established between United Nations Associations of Serbia and the Dialogue Café Association, the opening of two new Dialogue Cafe in Serbia (Belgrade and Subotica) are planned to be open in Serbia further to the one that is already operational in Novi Pazar. Thanks to this amazing partnership, the Dialogue Cafe network will be strengthen as a whole and its serbian leg consolidated. Dialogue Café is based on the radical but simple idea that people have many things in common and given the opportunity, they will explore their common interests, sparking collaborations and stimulating ideas that address the major issues of today. These kinds of conversations and collaborations can lead to new ways of thinking and doing: they can empower individuals and communities, break down prejudice and misconceptions and promote greater understanding and co-operation across cultures. Dialogue Café is a low cost, low carbon solution to the challenge of connecting people who want to share and collaborate for common interests in other parts of the world. It also provides a unique experience. The technology we use at Dialogue Café, TelePresence, links people through life-size high definition video and sound, allowing them to talk and meet in a context that is as ‘real’ as possible despite being located on different sides of the world. As such, Dialogue Café plays a role as a bridge to the rest of the world: it enables local hosts, and local civil society groups, to share their work, knowledge and ideas and learn from others from around the world. The Official Opening of Dialogue Cafe Belgrade will take place next 13th December 2016 from 15h to 17h London time. The event will include two parts: firstly, the official opening of DC Belgrade; secondly, a session on “Interethnic and interreligious trust, dialogue and cooperation – the importance of respecting human rights“. Dialogue Café Lisbon (Portugal): Ms. Helena Barroco (Executive Director a.i. of Dialogue Café Association and Diplomatic Adviser to former President of Portugal, Mr Jorge Sampaio). Dialogue Café Belgrade (Serbia): Mr. Milorad Kondic, President of the UNA Serbia, HE Irena Vojackova Solorano, UN Resident Coordinator in Serbia, HE Dragan Zupanjevac, Ambassador in Ministry of Foreign Affairs in charge of the UN and Mr. Nikola Rajicic, Deputy Director, Belgrade Youth office, City of Belgrade. Participants from Dialogue Café Cidade de Praia (Instituto Pedro Pires para a Liderança) will also take part in this event. Valuing diversity and building open, inclusive and tolerant societies are major challenges of our times. How can we communicate across differences and manage “cultural distances”? How can we develop further “cultural literacy” as well as increase the capacity to negociate and mediate differences? What are the skills needed to manage well differences and conflict and to generate cross-cultural creativity? Dialogue Café Belgrade (Serbia): PhD Milos Hrnjaz, Professor at the Faculty of programme or contact us. Join us and share with us this amazing moment for Dialogue Cafe Network! A new generation of practitioners have espoused the “handcraft” movement propelled by these uniquely skilled independent designers and artists. Some of them look to history to nurture their making and provide an added value to their creations, the value of preserving knowledge and cultural heritage. Most of them become inspired by their own culture, other prefer to drink from other continents. At the same time, we share a rich cultural heritage as a result of centuries of exchange and migratory flows. Promoting cultural diversity is essential for contributing to economic and social cohesion. In the framework of the cycle Global Exchange of Crafts Makers, a third global conversation on “Crafting cultural heritage: how to promote intercultural dialogue and diversity through traditional crafts” will be held next 29 September 2016 from 16h to 17h30 (London time) between Dialogue Café Évora, Dialogue Cafe Novi Pazar, Dialogue Café Lisbon and Dialogue Cafe Rio de Janeiro. During this session, participants will debate the intercultural bridges artisans might develop by inspiring their crafts product of different cultures and from different heritage. How artisans look to their own cultural heritage? In which ways artisans provide innovation to their products? How artisans look to the possibilities of being inspired from other cultures and heritages? Is there a space for cultural diversity in the artisan market? Download the cycle concept paper and the final programme or contact us for further information. In the framework of the cycle Global Exchange of Crafts Makers, a second global conversation on “Dialogue and conciliation between tradition and design means innovation?” will be held next 28 July at 17h (London time) between Dialogue Café Lisbon and Dialogue Cafe Rio de Janeiro. During this session, participants will debate the borders established between tradition and modernity and how artisans can dialogue between both by playing with design in order to reach innovation and provide an added value to their crafted goods. How older and young artisans apply tradition and design in their work in each participating country? How can we define the relationship between Designers and Artisans? Is there an interface for a well-balanced and mutually beneficial relationship applicable to worldwide crafts sector? Is traditional artisanship under the influence of the market? Can design provide new solutions to handicrafts? Download the latest version of the final programme!